Lock in a great price for NH Padova – rated 8.7 by recent guests! Easy to find, bedroom and bathroom were both good sized and updated. Breakfast is good. Room is quite comfortable and position is not so far from city center. The rooms are so clean and comfortable and also the staffs are so friendly and hospitable . Very comfortable and clean. Easy access to the city, train station and highway. Great breakfast with a great view of the city. Breakfast was very good. Quite and comfortable room. Staff was kind and helpfull. Breakfast was good, coffee also good with 2 automatic machine so no line to get the coffee. Dinner at the hotel also good compare we ate at the city. This property is a business class hotel. It is located two blocks from the train station and an easy commute to Venice. It is about a 15 minute walk into the center to local museums etc. It has parking, a rooftop restaurant with fantastic views, and plenty of breakfast items. The hotel can be busy at times with business travelers but as a tourist, we didn't mind. The front desk was very helpful, spoke English. It is very close to the Chapel that houses Giotto's ceiling! A must see if you are in the area. We would return to this location. Loved everything about this place- super comfy beds!!! Great value for money. Breakfast on the top floor with the terrace and view is amazing. Staff was very efficient. I booked a triple room, which was not available at our arrival, and in just a few minutes an additional bed was placed in the room. NH Padova This rating is a reflection of how the property compares to the industry standard when it comes to price, facilities and services available. It's based on a self-evaluation by the property. Use this rating to help choose your stay! 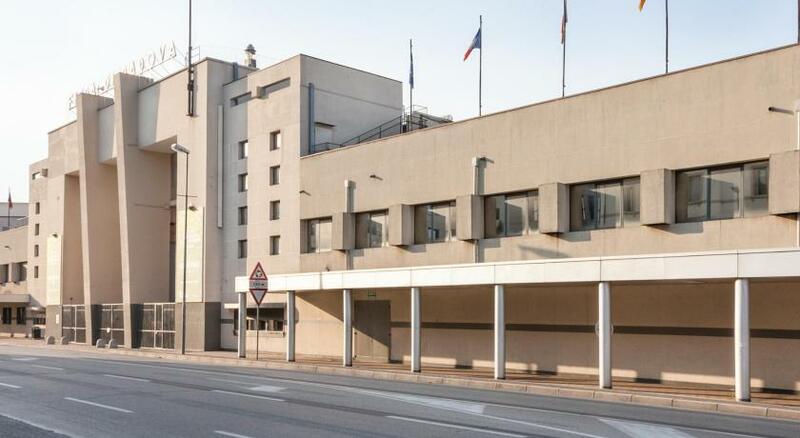 One of our top picks in Padova.Enjoy the comfort and modern design of NH Padova, offering free Wi-Fi, clean and spacious accommodations, and a location near the main railway station and trade fair. From NH Padova, walk to the railway station in 10 minutes and hop on one of the frequent trains connecting you to Venice. NH Padova is a design hotel set over 13 floors. Standard in-room amenities include LCD satellite TV, air conditioning and modern private bathroom. At NH Padova you will find the elegant Parnaso Restaurant on the twelfth floor, with panoramic views over the city center. Savor creative international and Mediterranean cooking. You will also start your day on the twelfth floor, with the hotel's breakfast buffet. Friendly and professional staff can assist you with car rentals, tour bookings and reservations for museums and events. When would you like to stay at NH Padova? Modern room with air conditioning, free WiFi and LCD satellite TV. Offering free WiFi, this air-conditioned room features a satellite flat-screen TV, soundproofing and mini-bar. This air-conditioned room comes with a flat-screen TV and a mini-bar. It features views of Padua and free parking. Overlooking the city of Padua, this suite features air conditioning, satellite flat-screen TV, sofa and soundproofing. The Hotel is characterized by bright environments and 13 floors where comfort and design come together perfectly. The main Restaurant has an exciting panoramic view, the 190 elegant and spacious rooms are fitted with all comforts. Moreover this hotel is ECO-FRIENDLY; certified according to ISO 14001 and 50001 standards. House Rules NH Padova takes special requests – add in the next step! NH Padova accepts these cards and reserves the right to temporarily hold an amount prior to arrival. Breakfast did not have many choices. Long walk to the old town centre (about 25 min). The breakfast was amazing! I think one of the best breakfast in hotels Ive ever had. We had dinner at the restaurant as well and the food was delicious! Great hotel and this won’t stop me from coming back but they seem to be understaffed. I have stayed in the Hotel before The hotel was hosting a football team who was given proritey over other hotel guests with a temporary dining / breakfast room being set up in a function room which was disappointing as the 12 floor dining is a feature of the hotel, bar / reception area also taken over. Hotel should have advised in advance to avoid dissatisfied. I have stayed here before, 10 mins walk to station, 30mins to Venice approx 5€ each. No tea/coffee facilities in standard room unless you ask even though there is a bar in the room. Also no Iron. Clean, modern hotel. You never wait long for lifts. The breakfast is good and the daytime staff especially Livio were friendly. The only thing I did not like was that they did not have a proper menu available until 7.30pm. when you arrive Jet lagged and need to eat at 6pm that was a problem and the bar food was very limited - most of the bar food is prepared by the restaurant which of course did not open until 7.30pm so choice was very limited. The room was very comfortable. The view from the restaurant at the 12th floor was superb. The only thing i don' t like with nh mantegna hotel is the fact that one of the best/most expemcive hotels in padova doesn't have feather pillows. I always ask, and never grt. They simply don't have it.